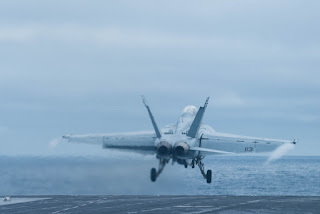 PHILIPPINE SEA - The John C. Stennis Strike Group (JCSSG) has completed routine operations in the South China Sea, and transited into the Philippine Sea through the Luzon Strait. The JCSSG operated in the South China Sea, March 1 through March 6. It was the crew's first time operating there since their regularly scheduled deployment began Jan. 15. The JCSSG conducted daily flight operations and a replenishment-at-sea during their transit, receiving advanced bio fuel, aviation fuel, and supplies from USNS Rainier (T-AOE 7). While operating in the South China Sea, the crew sharpened their skills in one of the most heavily trafficked areas in the world. Roughly $5 trillion in trade is shipped through the South China Sea every year. Senior Chief Quartermaster Henry Nicol, USS John C. Stennis' (CVN 74) navigation department leading chief petty officer, said it's essential to carefully monitor the ship's position and course, because of congested sea lanes. Sailors working in Stennis' Carrier Air Traffic Control Center (CATCC) also take on a more active role in controlling aircraft. Lt. Jason Falk, from the Wizards of Electronic Attack Squadron (VAQ) 133, from Stuart, Florida, welcomes the challenge. "It feels exciting," Falk said. "I'm putting what I have learned to use." Falk said the crew remains on higher alert while operating in this congested area to identify contacts as early as possible to maintain awareness. Additionally, People's Liberation Army (Navy) ships remained in the vicinity of Stennis during its time in the South China Sea. All bridge-to-bridge interactions between the Sailors of both navies were professional. "Based on the bridge-to-bridge communications USS Chung-Hoon had with the PLA(N) ships, it is clear that the Chinese Navy prides itself on professional communications and interactions," said Cmdr. Tom Ogden, commanding officer of USS Chung-Hoon (DDG 93). Rear Adm. Ronald Boxall, JCSSG's commander, said he is not surprised by other countries' interests in the strike group. "We're exercising our right to operate in international waters," Boxall said. "Our presence here promotes peace and stability in the region." The strike group is comprised of Stennis with Carrier Air Wing (CVW) 9 and Destroyer Squadron (DESRON) 21 embarked, Arleigh Burke-class guided-missile destroyers USS Chung-Hoon (DDG 93), USS Stockdale (DDG 106), USS William P. Lawrence (DDG 110), and Ticonderoga-class guided-missile cruiser USS Mobile Bay (CG 53). CVW-9 consists of Helicopter Maritime Strike Squadron (HSM) 71, Helicopter Sea Combat Squadron (HSC) 14, Airborne Early Warning Squadron (VAW) 112, Electronic Attack Squadron (VAQ) 133 and Strike Fighter Squadrons (VFA) 151, 97, 41, and 14. The strike group is the centerpiece of the Great Green Fleet, a yearlong initiative highlighting the Navy's efforts to transform its energy use to increase operational capability. JCSSG will use energy efficiency measures, to include technologies and operational procedures, and alternative fuel in the course of its normal operations. An F/A-18F Super Hornet assigned to Strike Fighter Squaron (VFA) 41 launches from USS John C. Stennis' (CVN 74) flight deck during operations in the South China Sea, March 5.